"This is my favorite paleo mug cake recipe that I altered. It's a quick dessert that satisfies any sugar or chocolate craving! Coffee can be used in place of coffee extract." Combine chocolate chips and olive oil in a microwave-safe mug; heat in microwave until melted, 20 to 30 seconds. Stir coconut flour, water, and baking soda into chocolate mixture using a fork. Add egg and coffee extract to chocolate mixture; stir well. Heat in microwave until cake is cooked through, about 1 1/2 minutes. Cool cake for about 2 minutes before eating. 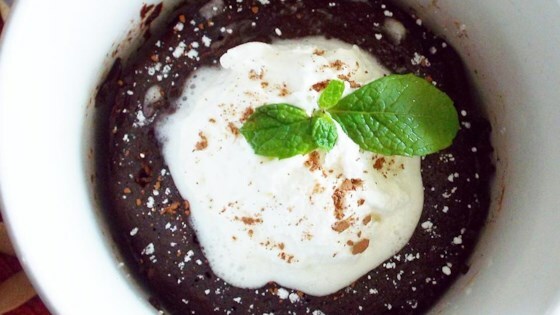 See what makes this chocolate mug cake paleo-friendlier. I used coconut oil and vanilla extract because that's what I had on hand. It was just ok, tasted a lot better once I topped it with whipped cream. I don't think I will make it again. I didn't have any eggs so I used liquid egg whites and it turned out amazing!! This is the best cake I've ever tasted paleo or not! I'll definitely be making it again!! I followed the recipe as written. If you're used to eating paleo this is a great quick treat!